After several nights of cloud and showers this weak front passed away today (Oct 23/24th 2007) leaving clear skies in its wake however the signs were not good with hazy sunshine and crepuscular rays indicating the sky was not as clear as I would want. After sunset the waxing gibbous Moon rose in the east within the belt of Venus with Earth's shadow below and with it came the arrival of very dense murk and haze which looked like a grey-green wall due to the Moon's illumination. I felt sure I would never see the comet this evening but I set up my scope in the back garden to cool down anyway and by 19.10 I was ready. I could see Arcturus in the west but his mag + 3.75 naked eye companion to the east was not seen which was not a good omen. Using binos was worthless so feeling blind I simply guided the scope into the murky section of sky between my neigbour's two houses and began a slow vertical sweep in the same fashion as I would be when searching for new comets. At 19.23 BST I found the comet!. Despite the horrible sky the coma was extremely bright and very small with sharp well defined edges and showing off a very vivid green colour. At centre was a bright white stellar central condensation with slight diameter with a tadpole-like spine of long length embedded within the type 1 ion tail which itself was colourless and extending north for 1 degree 10 arc minutes. The tail broadened rapidly as it left the coma and consisted of multiple components. Many very long bright blue streamers could be seen within. A faint wedge shaped grey type 11 dust tail could be seen for 5 arc minutes to the NE. The ion tail was superimposed on the northern section of this fanning tail. Comet was low in the twilight only 23 degrees from the Sun and some 15 degrees to the SE of Arcturus within Bootes and nearing the border of Virgo. 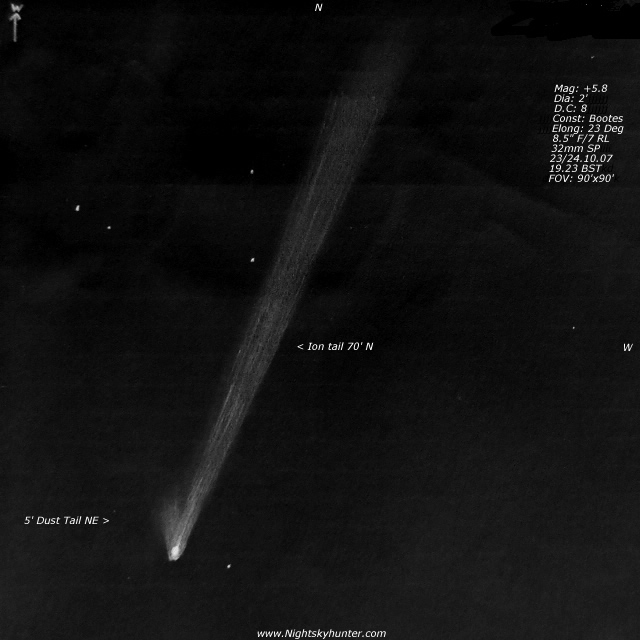 The comet looked in great shape but could not be seen with the 10x50s due to the murk. I lost the comet as it sank into the atmospheric quick sand in the west. On a better night I suspect this would be a great sight!. I am hoping for a better view tomorrow but I am delighted to have seen LONEOS again making this my 10th observation. Mag: + 5.8? Dia: 2' D.C: 8.